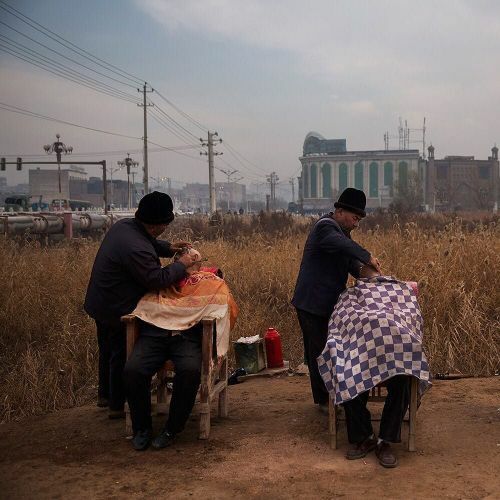 "Barbers gave #Uighur men shaves in Kashgar, in China's Xinjiang region. The police have restricted Uighurs from growing long beards and women from wearing veils in #Xinjiang. Now only elderly Uighur men can grow long beards. The restrictions on facial hair and veils are among a number of measures aimed at shaping the behavior and beliefs of China's 10 million Uighurs, a Turkic-speaking Muslim minority. The Chinese government's view is that tougher security and tighter restraints on the practice of Islam are the best way to stem a wave of violence that included a knife attack that killed dozens in September. @adamjdean photographed life in #Kashgar while on #nytassignment." By nytimes on Instagram.